Engineers at the Swiss Federal Institute of Technology in Zurich have developed a pair of quadcopters that can collaboratively assemble a rope bridge that's sturdy enough for a person to walk across. What's harder to see in the video above is that the whole room is equipped with a motion capture system that tells the drones their position relative to the scaffolds and each other. That data is processed through a computer that then sends commands out to the flying drones. 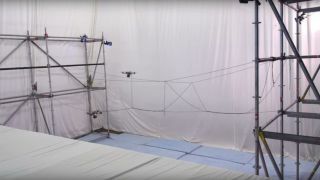 The researchers behind the feat said in an online description of the project: "The rope bridge acts as a demonstrator, showing for the ﬁrst time that small ﬂying machines are capable of autonomously realizing load-bearing structures at full-scale and proceeding a step further towards real-world scenarios."